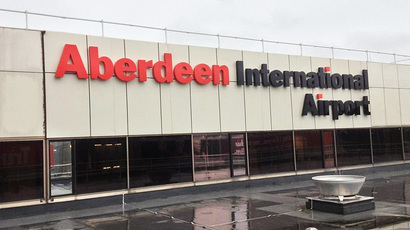 A wheelchair user who was refused access to an accessible taxi at Aberdeen Airport has received a full apology. Liz Mackenzie, 59, was visiting Aberdeen last weekend to spread the ashes of her late parents, Dorothy and David, at Hazlehead Crematorium. But when her group – including Barbara Howard, who also uses a wheelchair – tried to board six wheelchair taxis at the airport, they were denied entry to the vehicles. They contacted the Press and Journal about their ordeal, prompting a flood of other disabled people to come forward with their own similar experiences. Now Mrs Mackenzie has been contacted directly by airport bosses, who have explained what action has been taken this week. Airport officials have checked that all cabbies at the site with wheelchair-access facilities can actually operate them and prove their ramps were functioning, and spoken to the drivers involved. She said: “I have had a call from Stewart Duncan, who is the airport’s taxi manager, who rang me to give his full apology for the behaviour of the taxi drivers at the airport. “He has personally got every driver of a wheelchair accessible taxi for the airport to demonstrate they can use the equipment by getting him into their taxis, in a wheelchair. Last night, Mr Duncan told the Press and Journal: “Since Mrs Mackenzie’s experience, we have taken steps to ensure that our taxi fleet are proficient in the use of DDA (Disability Discrimination Act) compliant vehicles. “This is in order to completely avoid incidents of this nature going forward. “We set up training sessions to ensure those with accessible vehicles could utilise their wheelchair facilities properly and show that they’re fit for purpose. “We will undertake these sessions periodically with the drivers’ support.